The 2018 legislative session marks the first one without fiscal stalwarts Brandt Hershman and Luke Kenley, both of whom retired from the Senate – Hershman’s announcement coming just before Christmas. While it’s hard to replace such experience and wisdom, those stepping up to fill their shoes have been waiting in the wings for a while and should make for smooth transitions. Back in mid-July, Sen. Ryan Mishler (R-Bremen) was tapped to succeed Kenley as the chairman of the Senate Appropriations Committee, which is tasked with that chamber’s budget-writing duties. Mishler was the ranking member of that group for years and worked on the school funding formula component of the budget. Senator Travis Holdman (R-Markle), who takes over for Hershman as chair of the Senate Tax and Fiscal Policy Committee, has been the long-time ranking member there and often assumed the chairman’s role during meetings. Holdman is well versed in the matters that come before the committee and the business community will continue to be well served by his thoughtful viewpoints. To take that post, Holdman relinquished his leadership on the Senate Insurance and Financial Institutions Committee. The “next man up” there is Sen. Chip Perfect (R-Lawrenceburg), who is a no-nonsense and intelligent legislator. He has been extremely helpful on labor issues and owns several businesses himself, so he knows the difficulties that businesses face. That perspective will likely also factor into how he handles the health insurance bills, which are now being assigned to his committee. The Governor and General Assembly have continually heard from Hoosier employers on the need for a skilled workforce – and better aligning state programs with job demand. The good news is bills are being introduced to address those concerns. While only a handful of measures have been released to date, we are seeing legislation related to training tax credits and grants, as well as efforts to streamline current workforce programs. We anticipate a comprehensive workforce bill (1002) will be introduced in the House later next week. The Governor’s computer science bill (SB 172) requires all public schools to offer a one-semester elective computer science course at least once each school year to high school students. We expect a hearing on this measure in the next two weeks. Both this and the workforce efforts are 2018 Indiana Chamber legislative priorities. Senate Bill 257 has been introduced by Sen. Travis Holdman (R-Markle) to serve as the beginning of discussions on clarifying the exempt status of computer software sold as a service (SaaS) – a Chamber priority. Holdman is also authoring another major piece of tax legislation, SB 242, which contains a variety of tax matters. The House bills are coming in too, with a good number already filed addressing local tax issues. Speaking of local matters, the Chamber is very pleased to see that the House Republican agenda includes a bill that will make township government more effective and efficient by the merging of townships (approximately 300) where less than 1,200 people reside. Such local government reform has been a longstanding Chamber goal. 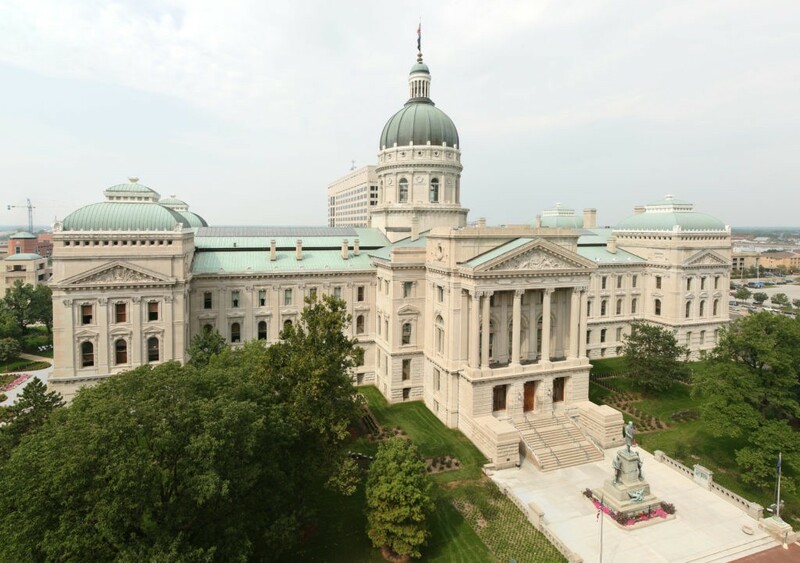 In addition to SB 257, other technology-related bills include Rep. Ed Soliday’s (R-Valparaiso) autonomous vehicle (AV) proposal to position Indiana to safely test and implement AV technology with automobiles. 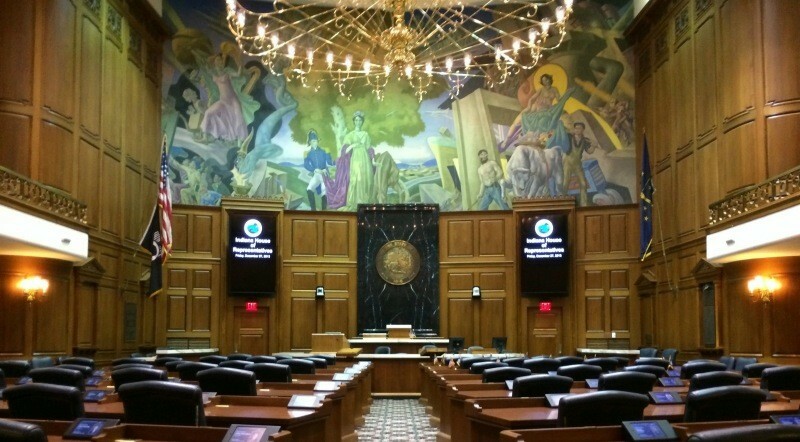 The bill also will address truck platooning, which uses GPS and WiFi technology to allow trucks to more closely follow each other for greater efficiency, on Indiana roads. Rural broadband, high-speed internet and small cell wireless structures technology all will be topics for the Legislature to debate. Certified technology parks also will be discussed with the idea to have an additional capture of sales and income tax revenue for those complexes that perform well. In health care, enabling employers to ask prospective employees if they are smokers not only heads the Chamber’s wish list but also appears to be gaining traction this go-round. Eliminating the special protections (currently in state statute) for smokers is found in SB 23 and will be guided by Sen. Liz Brown (R-Fort Wayne). The bill has a pretty good chance of getting a hearing in the Senate – which would be a first. Previously, a measure was taken up in a joint hearing in the House. Increasing the tobacco tax and raising the legal age for smokers to 21 are policies that likely will be included in a bill to be introduced by Rep. Charlie Brown (D-Gary). The Indiana Chamber is supportive of both. Nine utility-related bills are on our radar screen at this point. They range from tweaks of last year’s big legislation (like SB 309, which addressed rising energy costs and a long-standing struggle between the investor-owned electric utilities and larger consumers of energy) to compulsory sewer connection, excavation for infrastructure, regulation of solar energy systems in homeowners’ associations and new water legislation. Separately, Sen. David Niezgodski (D-South Bend) has a proposed ban on coal tar pavement sealer, which we oppose. There are also a number of bills proposing changes to Indiana’s alcohol laws including: Sunday sales, cold beer sales by grocery and convenience stores, and increases in fees and penalties. The Chamber will be providing more details on all of these bills as the session progresses. For anyone who wants a refresher about how legislation becomes law, the Chamber has a handy guide free of charge. It includes a diagram of the bill process, a glossary of often-used terms and a look at where bills commonly get tripped up. Additionally, the Chamber will be providing updates and issuing pertinent documents throughout the session at www.indianachamber.com/legislative. 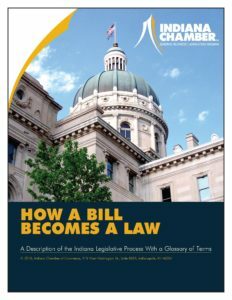 For anyone who wants to learn more about how legislation turns into law in the Hoosier state, the Indiana Chamber has a handy guide free of charge. 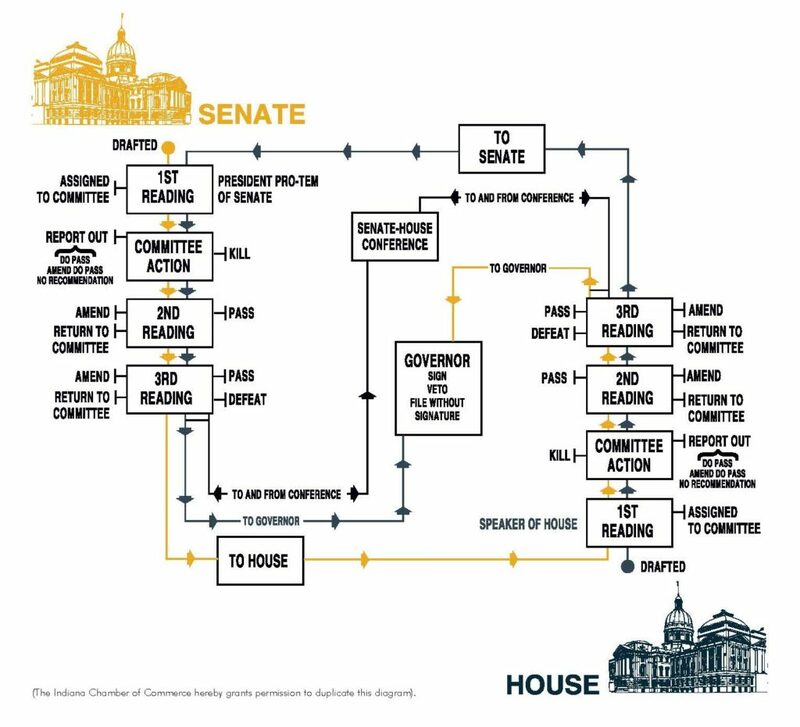 Among what’s included: a diagram of the bill process, a glossary of often-used terms and a look at where bills commonly get tripped up. We encourage you to download the 11-pager and follow along with what’s going on at the Indiana General Assembly. The Indiana Chamber will be providing updates and issuing pertinent documents throughout the session at www.indianachamber.com/legislative. We’re almost there. Tax reform has passed both the House and Senate. It now seems very possible that the President will have a bill to sign by Christmas. As some have described: All they need to do now is “sand the rough edges”. But another saying is equally applicable to the business tax components: “The devil is in the details”. Specifically, details directly relating to the taxation of both C-corporations and pass-through entities. Terms that will impact those who do business here and those who do business around the globe. In other words, details that will significantly affect big businesses, small businesses and everybody in between. The process for reconciling the two versions of tax reform is already underway as the House and Senate name members to the conference committee that will determine exactly what will be in the package before it is voted on one last time. Indications are that majority leaders want to have a committee report for their respective bodies to act on by the end of next week. So while the details still have to be worked out, both bodies are very engaged and they’ve passed legislation that defines the general parameters. There will continue to be debate, in public and in private, over the deficit, how much growth tax reform will generate, who benefits and who doesn’t, but the House and Senate are effectively committed to getting something done at this point. On the individual income tax side, they will need to find agreement regarding the limits on the deductibility of state and local taxes (SALT), as well as mortgage interest. These items are important to individuals, important to the numbers and important politically. But the two sides really aren’t that far apart. A $10,000 SALT deduction of some kind and a healthy mortgage interest deduction will almost certainly remain in the final product. But where they land on many items critical to business is harder to predict; a lot is up in the air. Let’s start with the corporate rate itself. While both plans call for a 20% rate, the President hinted it could still change slightly. That appears unlikely, however, but the rate is tied closely to the fiscal projections. And the fiscal projections are why the Senate delayed the effective date for corporate rate change to 2019, to reduce the cost of the bill. So when exactly the change goes into effect is at issue. Similarly, the taxation of pass-through income is also unsettled. The House limits the pass-through rate at 25%. 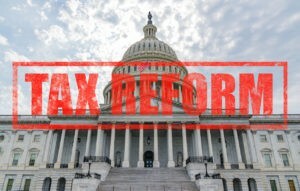 The Senate approach was to give a deduction to pass-throughs to keep their tax down. Effectively, the different approaches would not have drastically different bottom line impacts for most pass-through income recipients. The real complications come via provisions directed at guarding against individuals in higher brackets from categorizing personal income as business/pass-through income. What about the issues of interest to multinationals who conduct huge volumes of business activity around the globe? The House and Senate agree that the U.S. must move to a territorial system and companies shouldn’t be taxed here on income they earn overseas. But beyond that basic principle, how multinationals and their foreign-sourced income is handled is anything but clear right now. Both the House and Senate have included forms of supplemental taxes intended to prevent their perception of “base erosion” and to discourage what they view as corporations “gaming the system”. Of course, there are many, many other pending issues wrapped up in this legislation for the tax folks in Washington to resolve in short order. They include the health care mandate, estate tax, exemptions for educational institutions and nonprofits, and the list goes on. Tax reform appears close. Let’s hope good solutions are close too. It’s been a busy week for Republicans wanting to challenge Sen. Joe Donnelly for his seat. The number now stands at six. On Wednesday, Congressman Todd Rokita (IN-04) officially announced his intentions while on the steps of the Indiana Statehouse – it marked the first stop in his nine-city tour sharing the news. Rokita’s campaign slogan promises to “Defeat the Elite” in Washington. Meanwhile, Congressman Luke Messer (IN-06) will formally announces his bid Saturday at the 6th Annual Messer Family BBQ in Morristown. “As a young and talented member of the Indiana House, Luke proved his conservative credentials early on by helping us create a new vision for Indiana in partnership with Gov. Mitch Daniels. As a strong and innovative leader for educational choice, Luke fought to ensure Hoosier families and children have the options they need to obtain a world-class education. As a quickly-rising star in Congress, Luke has proven he can work with difficult coalitions of interests to move an agenda for the American people. State Representative Mike Braun of Jasper officially entered the race on Thursday. He previously cited the public sparring of Messer and Rokita as well as his business experience as reasons for his decision. Meanwhile, Indiana Attorney General Curtis Hill made it clear on Wednesday that he hasn’t ruled out joining the GOP primary. Other Republicans already in the field are Hamilton County businessman Terry Henderson, Kokomo attorney Mark Hurt and Floyds Knobs educator Andrew Takami. In terms of any congressional endorsement the Indiana Chamber may provide, the matter is taken up by our federal political action committee (PAC). Bill authoring and voting history on pro-jobs, pro-economy legislation and in-person interviews of the candidates will play large roles in the decision making. 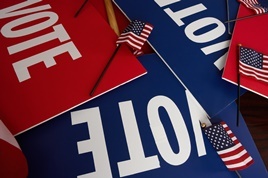 The PAC’s work won’t begin until after the candidate filing deadline early next year – as it’s possible a candidate may decide not to run, while there also could be someone else elect to throw their hat into the ring. But when the time comes, you can be assured that a thorough vetting process will take place before a determination is made to endorse a candidate (or no candidates). BV: What is your view on the federal tax code … are there areas you feel need attention? If so, what reforms do you see as the most important? YOUNG: “We need to simplify the tax code. Washington needs to stop picking winners and losers through the tax code. We need to stop the double taxation of overseas income so that hundreds of billions of dollars of U.S. profit can be repatriated and invested in places like Indiana to create jobs and raise wages. BAYH: “We need a tax code that is certainly simpler; it costs way too much to comply with it; it’s way too complicated. One of the areas I think we can get some bipartisan agreement on would be in the area of corporate tax reform – to get the tax rate down to make us globally competitive. Currently we have one of the highest corporate tax rates in the world, which leads to a couple of negative consequences. Number one: A lot of businesses that are globally competitive have stranded profits abroad. I think it’s in excess of a trillion dollars. So by making the corporate rate globally competitive, we would allow them to bring those profits home to invest in their U.S. operations. Read the full Q&A online. 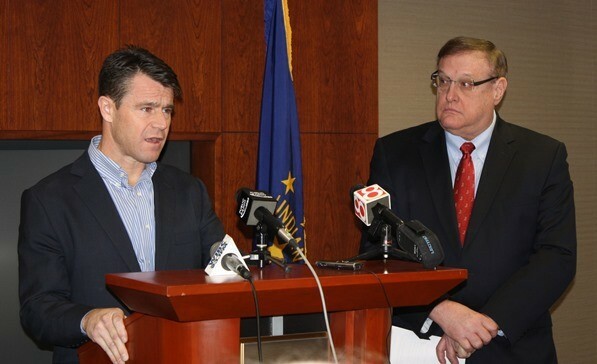 At a series of press conferences Aug. 29, the Indiana Chamber reaffirmed its endorsement of Congressman Todd Young (R-IN, 9th District) for the U.S. Senate. The announcement was first made at the Associated Builders and Contractors training facility on the east side of Indianapolis, followed by stops in South Bend and Fort Wayne. The organization previously had endorsed Young in the primary before Evan Bayh, former U.S. senator and Indiana governor, emerged as the Democrat candidate. Once Bayh entered the race, our congressional affairs committee thought the appropriate action was to take another look at this race and talk with him about policies important to the business community. We were able to do that recently and appreciate Sen. Bayh’s willingness to have that discussion. At the end of the day, however, our committee overwhelmingly decided to keep our endorsement with Congressman Young. His military, business and government experience have him prepared to take this next step of leadership. Young is also an economic-minded individual who has repeatedly demonstrated prudent decision-making on issues that are vital to jobs and economic growth. Additionally, Young’s engagement with the business community and his focus on economic, fiscal and regulatory issues were key factors. After he was appointed to the Ways and Means Committee, the congressman sought substantial feedback on potential federal tax reforms and what would have the most impact on Hoosier companies and their employees. He listened to our members – through personal conversations and a survey – using their insights to help form his pro-economy agenda. The Indiana Chamber frequently hears from its members about burdensome federal regulations. They bring uncertainty and put a stranglehold on job creation. Congressman Young understands these frustrations and has sought to remedy that. In each session, he has introduced legislation (the REINS Act) that would require members of Congress to vote on major rules before they go into effect. At both the state and federal levels, Indiana Chamber endorsements are driven by vote scores on pro-jobs, pro-economy issues. For state endorsements, the Indiana Chamber relies on its Legislative Vote Analysis report. Congressional endorsements are based on a combination of the U.S. Chamber’s own vote scores and an analysis of votes on Indiana Chamber federal policy positions. The U.S. Chamber’s lifetime congressional voting record for Bayh is 55%; Young is at 91%. The Indiana Chamber’s congressional affairs committee, which determined Young’s endorsement, is a nonpartisan group comprised of volunteer business leaders from around the state. Representatives of the U.S. Chamber, which also is supporting Young’s general election campaign, joined the Indiana Chamber for the press event. Congrats to Rep. Todd Young! The Indiana Chamber, along with the U.S. Chamber, proudly endorsed Rep. Todd Young in the GOP primary for the open U.S. Senate seat being vacated by retiring Sen. Dan Coats. He defeated Rep. Marlin Stutzman last night, securing an astounding 67% of the vote. RTV6 captured his victory speech. Way to go, Rep. Young! The Indiana Chamber is endorsing Congressman Todd Young (R-IN, 9th District) in his candidacy for the U.S. Senate. The announcement was made today at a press conference at Indiana Chamber headquarters in downtown Indianapolis. Brinegar further emphasized Young’s engagement with the business community and his focus on economic, fiscal and regulatory issues. The Indiana Chamber’s nonpartisan congressional action committee, comprised of volunteer business leaders from around the state, determined Young’s endorsement. At both the state and federal levels, Indiana Chamber endorsements are driven by vote scores on pro-jobs, pro-economy issues. For state endorsements, the Indiana Chamber relies on its Legislative Vote Analysis report. Congressional endorsements are based on a combination of the U.S. Chamber’s own vote scores and an analysis of votes on Indiana Chamber federal policy positions. Representatives of the U.S. Chamber, which also is supporting Young’s campaign, joined the Indiana Chamber for the press event. One of State Senator Brandt Hershman’s first jobs was in the White House. But thankfully he eventually moved back to Indiana, and is now considered a jack of all trades on the Senate leadership team. He “sweats the details,” and has helped make Indiana a fiscally responsible and business-friendly state. That’s why the Indiana Chamber named him the 2015 Government Leader of the Year.